* Please refer here for the overall schedule of the Festival. 31.10.05 Performance record of "Red, Red, Red Shoes" was uploaded !! 31.10.05 The report on “Introduction to Lecoq System” Workshop was uploaded !! 17.07.05 Shows and workshop info was updated !! 22.04.05 BBS was opened !! 01.12.04 English site was opened !! 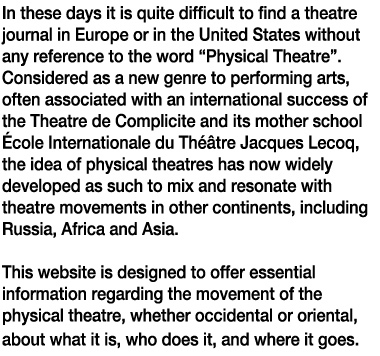 26.06.04 Total renewal of Physical Theatre Forum website ! !